The first thing that we did was we measured the points between the four rocks that we spray painted in paces. We counted how many paces at what degree from one rock to the next. We then on our map converted paces to millimeters and used a protractor for the degrees. 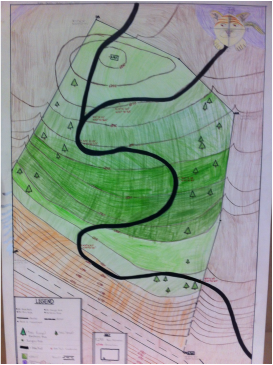 We were able to see the terrain from a birds eye view and then used the elevation to place the contour lines. The contour lines show the type of terrain and the elevation of the terrain. This project helped us to see how space is related from real life to a piece of paper. A Rube Gold Burg is a number of steps all leading up to one simple task. The project that we did was to create one with a few challenges. It all had to last 15 seconds, It had to have 15 steps, and it had to have three simple machines. The project itself lasted around 6 weeks. We also had to design and make a digital version of our Rube and solve 8 calculations on our rube. The 8 calculations are represented as numbers on the digital version. Day 6 Entry 1 - Yesterday we launched the Stark (our rocket) at 45 psi. It flew well but the parachute didn't deploy. Today we redesigned our parachute. Will test tomorrow. Day 7 Entry 2 - We launched rocket at 70 psi. Top half detached from bottom bottle. Parachute ruined. Day 8 Entry 3 - Re-glued rocket. Made new parachute. Planning to launch tomorrow. Day 9 Entry 4 - Rocket blew in half at launch at other seem. Launched at 70 psi. Changed psi. to 60 instead of 70. Day 10 Entry 5 - We re-glued. Day 11 Entry 6 - Spray painted our rocket. Day 12 Entry 7 - Spray painted another coat on rocket. Day 13 Entry 8 - Christened "The Stark". Day 14 Entry 9 - Mental preperation. building the rocket and launching was like a 9. At landing our rocket only had a few dents and bruises but no holes and could probably fly again. Daves cat music and try to make a full proof parachute/landing gear. Our angle at the exibition was 89* and we watched are rocket deploy from 52m. away and the real hang time in the air was 7.94s. The max height of our rocket was 3,020*. And our average actual velocity was 380.3*m/s. Our rockets theoretical hang time was 86.3s and our actual hang time was 7.94s. The percent error was 69.4%, that's because our launch preesure was only 110psi which is a lot for a water rocket but it's not enough for the rocket to be in the air for more then a minute The percent of the error is so high cause the angle was off so then making the height seem higher and the rocket flight.